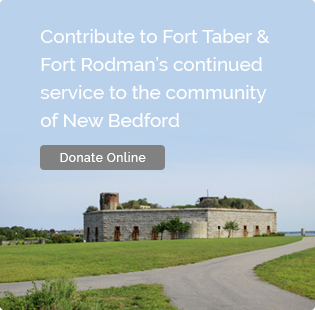 Fort Map & Gun Batteries – Fort Taber / Fort Rodman Historical Association, Inc. 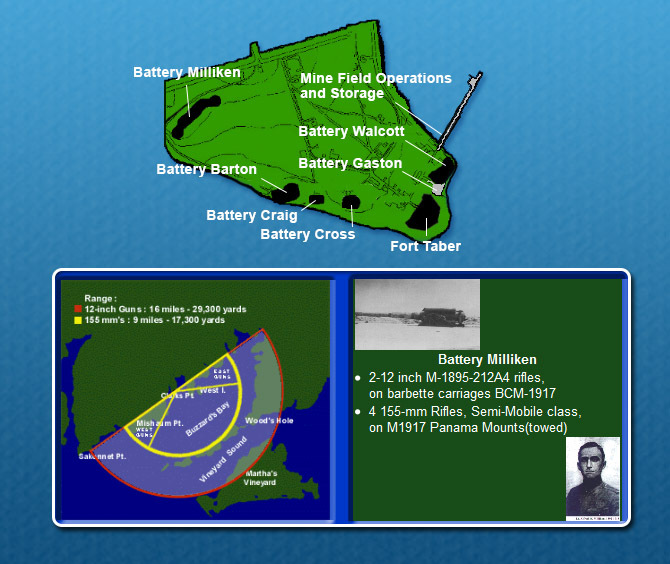 This battery was named in honor of WWI hero, 2nd Lieutenant Alfred W. Milliken, 6th Engineers. A New Bedford native, Milliken was killed in action March 30, 1918. 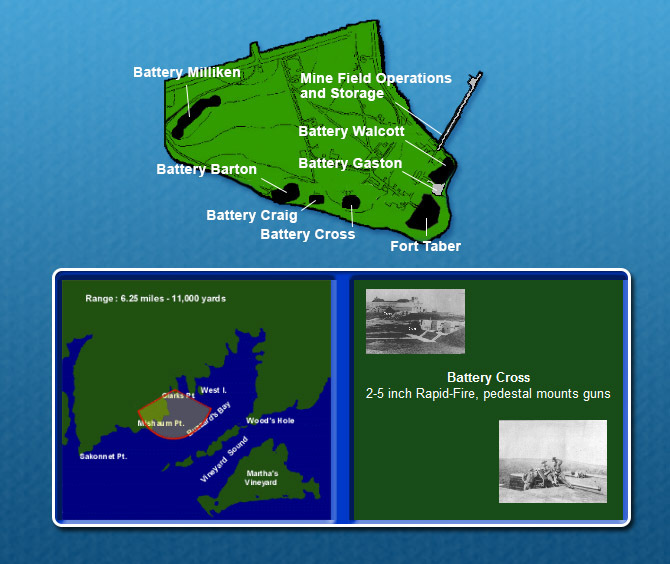 The battery was completed in the early 1920's and housed two immense 12 inch rifles that had a range of 16 miles, and provided protection for all of Buzzard's Bay. 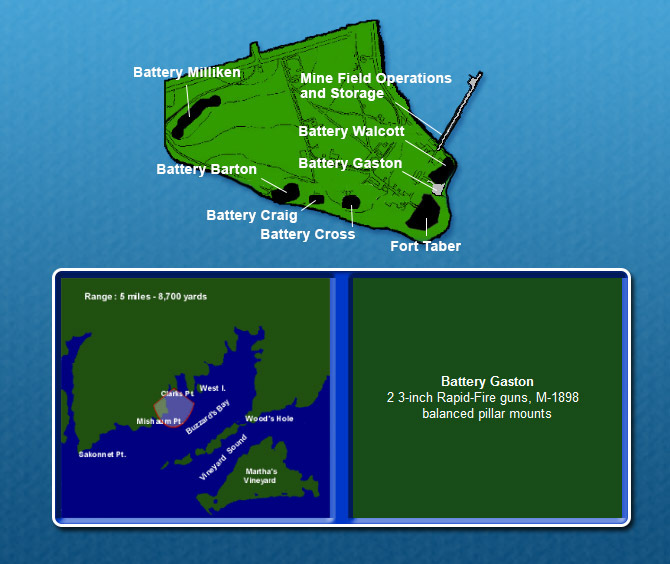 Battery Milliken also featured underground magazines and a generating plant. In 1935, the battery was modified to meet bombproof specifications and maintained well over 16 feet of re-enforced concrete and tons of earth over each gun for protection against air and sea bombardment. 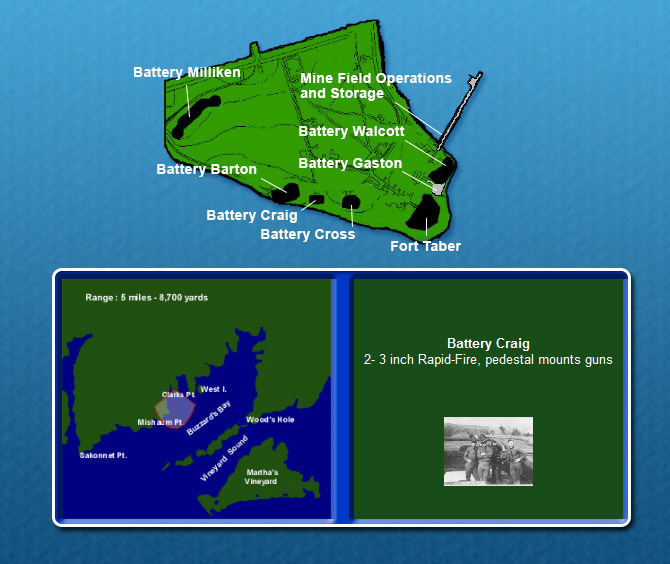 The range of Battery Milliken was 29,300 yards at 45 degrees elevation and encompassed the Elizabeth Islands, a portion of Martha`s Vineyard, and the southern approach to the Cape Cod Canal. 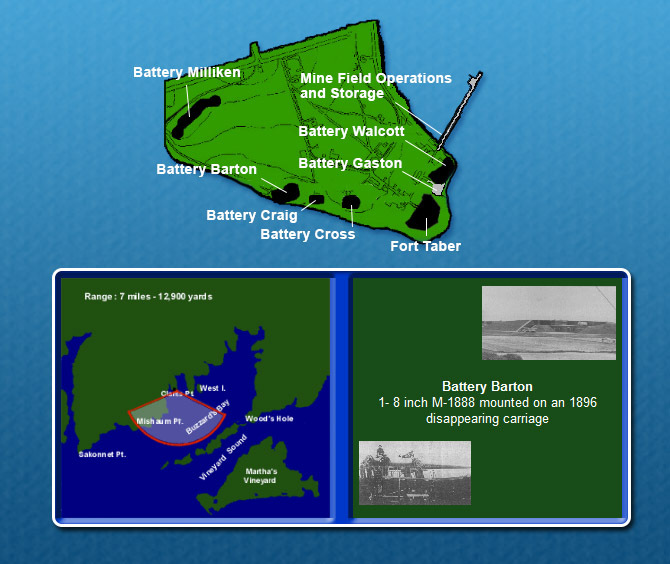 Built in 1899 this battery on the west side of Fort Taber was named in honor of Col.William Barton who served in the Revolutionary War. This battery was armed with a "disappearing" 8-inch gun. Built in 1902 this battery was named in honor of Col. Cross, United States Engineers. Cross was killed in action during the Civil War Battle of Fredericksburg, Virginia, on June5, 1866. 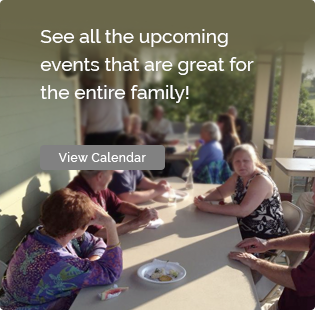 Located to the immediate west of Fort Taber. Located immediately west of Battery Cross, this battery was named in honor of 2nd Lt. Craig, United States Artillery. Lt. Craig was killed in action at the Battle of Bull Run, Virginia, on July 21, 1861. This battery was also built in 1902. In 1840 it was decided to erect a fortress to protect the important industrial base and fine harbor of New Bedford. Major R. Delafield,(considered to be the "Father of American Seacoast artillery") and Captain Robert E. Lee(later to become the Commander-in-Chief of the Confederate Armed Forces) drew up plans for a pentagonal shaped, 3-tier fort, that was to house 70 guns. The amount of $50,000 was authorized and in 1857 construction began. With the appointment of Lt. Henry Martyn Roberts as Supervisor of Construction in 1862, the first cannon was in place by 1863. Unfortunately the end of the Civil War in 1865 rendered the granite fort obsolete and by 1871 it's construction was halted. The third tier was never completed and the unused blocks make the seawall that lines the eastern seashore and beach. The fort was originally named after the city's mayor at the time of construction, Mayor Isaac C. Taber. The army officially named it Fort Rodman after the New Bedford resident Lt. Col. Logan Rodman 38th Massachusetts Infantry, who fell at the head of his regiment at the assault on Port Hudson LA. in 1863. 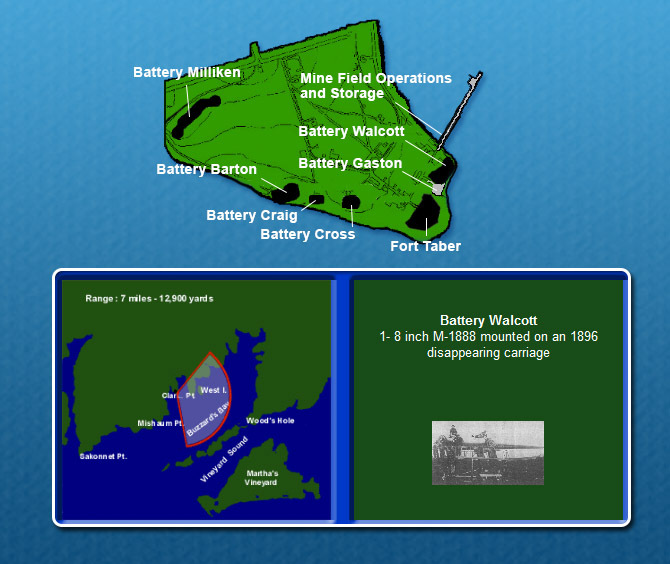 This battery was a small emplacement located adjacent to Battery Walcott, to the left of Fort Taber. It was named in honor of 2nd Lt. William Gaston, of the First Dragoons. Gaston was killed in action on May 17, 1858, while fighting the Spokane Indians on the Snake River, Washington Territory. This battery was equipped with 2 rapid fire 3" guns, that were helpful in defending the area`s mine fields. Battery Gaston had mounted guns for only a short period. It's primary purpose then became to house ammunition for the adjacent battery Walcott. Built in 1899 this battery on the east side of Fort Taber was named in honor of Col. William Walcott who served during the Civil War. 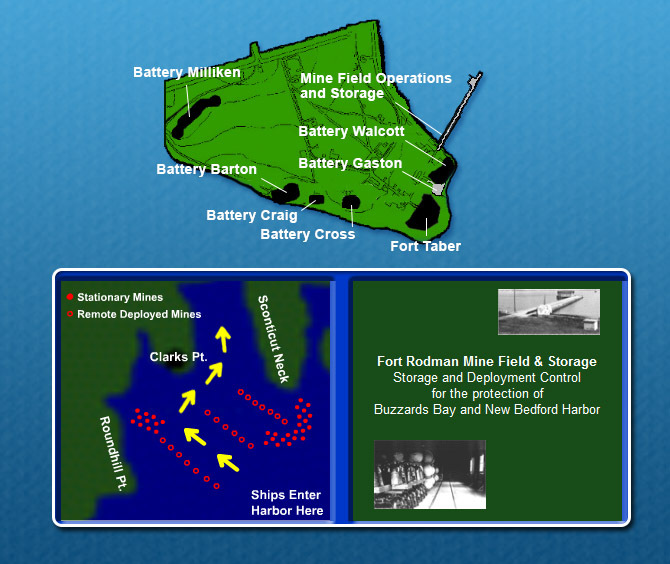 Built in the 1900's the Fort Rodman mine field and storage house was constructed to aid in the protection of Buzzards Bay and New Bedford Harbor. . 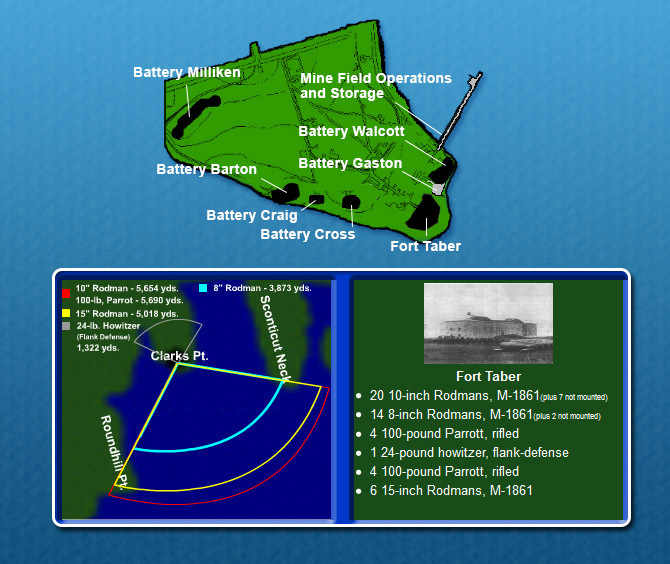 Located to the immediate west of Fort Taber, the storage house housed the remote-deployed mines and corresponding anchors. The Remote-Deployment controls shed, is still located between the pier and Battery Walcott(aka. Walcott #2). The Remote-Deployed mines were placed in staggered rows in the harbor, with cables connecting them to the Remote-Control shed. The concept was that when an enemy ship would enter the harbor, the remote-control levers were pulled, it's corresponding mine would release, arm and float to the surface.